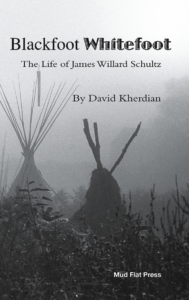 by David Kherdian – James Willard Schultz was the first white man to penetrate the Blackfeet tribe, participating in their rituals, buffalo hunts, horse trading and stealing, all the while keeping notes, with the intention of one day recording their history. When his wife died he left the tribe and moved to California, where he began to write stories, novels and memoirs of his time with the Blackfeet Indians of Montana. This biography of his early years with the tribe is an outstanding adventure story and also a love story of two people, who are strangers to each other at the start, but grow in understanding and love through their devotion to one another. David Kherdian is an internationally known poet, novelist and memoirist whose work has been published in 17 languages. He has published 13 volumes in his acclaimed Root River Cycle, consisting of poetry, memoirs and novellas. His biography of his mother, The Road From Home received numerous awards, including a Newberry Honor Book Award and a nomination for the American Book Award. He is the author of 75 books and has been the editor of three journals.